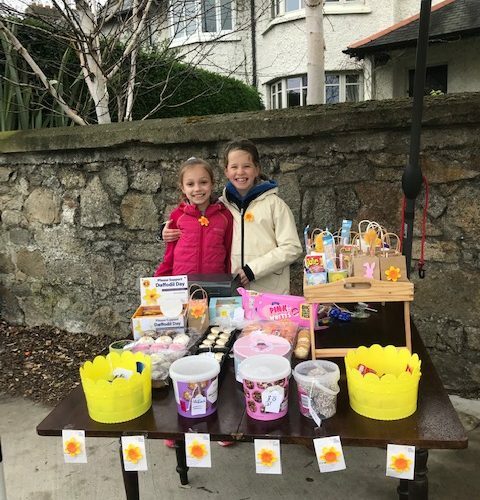 It is a family tradition of mine (Rachael) to do a Daffodil Day stall every year. My great-uncle was in Canada when he saw another society that had a dedicated day (and flower) to raise money for charity. My great-uncle thought this was a great idea and brought it home with him to Ireland. Daffodil Day is now celebrated every year! We left school early on 22nd March so we could catch the younger children when they were leaving school. We sold biscuits, cakes, bags of sweets and jellies. We met two ladies at our stall – one with cancer and one who had cancer previously. They were both really nice and it was very inspiring meeting them. Overall, we were at our stall for four and a half hours. In that time we managed to raise over €800!